This is probably the type of heating system in your home or office today, and it was a viable method of providing heat for decades. With this system your boiler is either on or off; running at full capacity until the thermostat temperature is met or exceeded then shutting off until it is needed again. 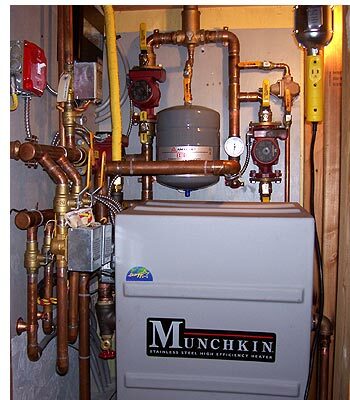 In addition, many heating contractors employ a "bigger is better" strategy and install over-sized systems. Advanced Comfort Systems will conduct heat loss calculations to ensure the correct boiler is in use, and will also ensure correct and optimal piping is used to make the most of your conventional heat system. A good design goes a long way. Simply put, however, these conventional systems are inefficient from a mechanical and energy usage standpoint. So what type of heating system should you consider? Modulating/Condensing boilers, or Mod/Cons, are our personal favorite heating systems. We carefully select our boilers for their efficiency, performance, reliability, and size. We are one of the only area contractors that uses a Digital Combustion Analyzer to plot a heating curve, the only way to properly program a Mod/Cons boiler. It's something with which Advanced Comfort Systems has a great deal of experience. While installation costs may be higher, Mod/Cons systems will provide more heat for less money and maintenance for many years to come. Rather than shutting on and off, these heating systems run continuously and "modulate" based on need. This provides a more consistent and therefore more comfortable heat. As a condensing boiler it will reuse combustible flue gases producing primarily water vapor an exhaust product. This allows the system to heat your home efficiently with environmentally friendly results. How could it get any better? Obviously your heating systems doesn't need to work as hard on cool days in Spring and Fall as it does in the coldest Winter months, but it does! Advanced Comfort Systems makes sure that your heating only works as hard as it needs to based on feedback from both indoor and outdoor temperatures. Not only will your system run more efficiently, meaning less maintenance, but this too will help provide more heat for less money. Now if you love getting more heat for less money, read about our Radiant Heating Systems.